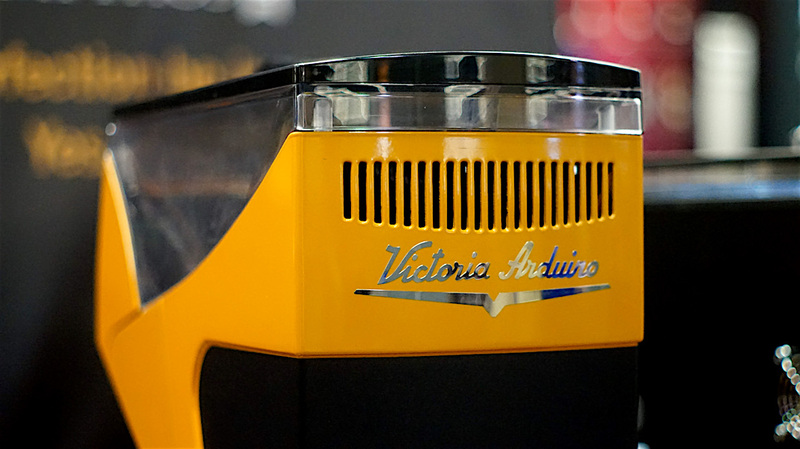 The Simonelli Group Mythos 2 espresso grinder on display at the 2018 SCA Expo. Daily Coffee News photo by Howard Bryman. 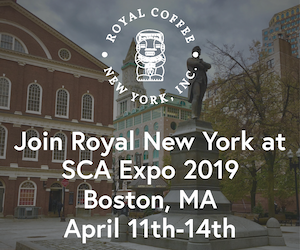 Visitors to the Nuova Simonelli booth at last month’s Specialty Coffee Association Expo in Seattle were given an early glimpse of the highly anticipated Mythos 2 espresso grinder, designed to be bigger, faster, cooler and more controllable than its already successful predecessor. 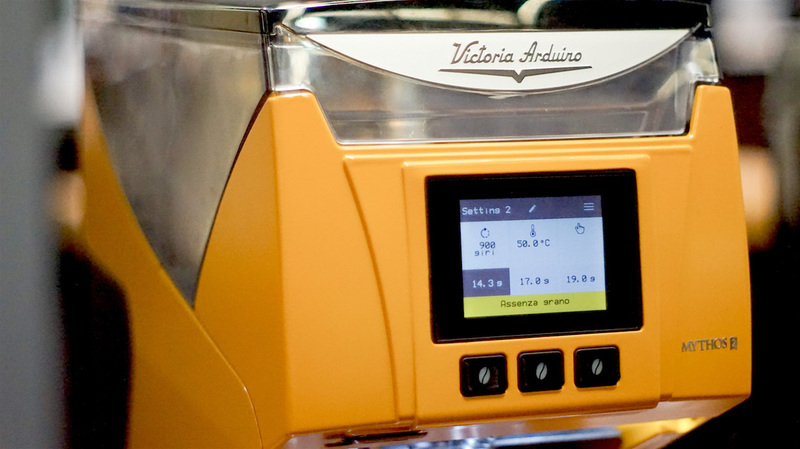 The most significant innovation boasted by the Nuova Simonelli/Victoria Arduino Mythos 2, which is entering production in the coming months, is its Clima Pro 2.0 technology, which not only achieves lower operating temperatures than the original Clima Pro, but will precisely maintain a temperature designated by the user. Temperature stability is important for maintaining accuracy in dosing as well as for more consistent “granulometry,” according to the company. Simonelli Group Mythos 2 product photo. The Mythos 2 will also optionally include an inverter-equipped variable-speed motor that ranges from 600 to 1,200 RPM while consuming less electricity. Its grinding chamber has been slightly enlarged to accommodate 85-millimeter titanium burrs that are 10 millimeters wider than the original Mythos burrs. 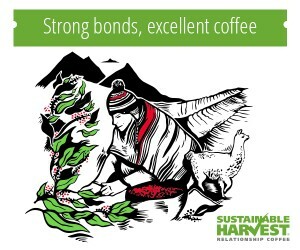 Beans from the Mythos 2’s larger 2-kilo hopper are delivered into the chamber by a helical system that maintains a consistently pressured feed. 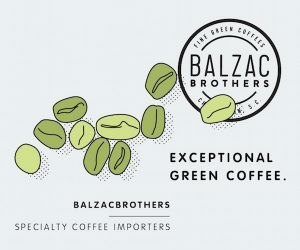 Other improvements include quieter overall operation, vents located only on the back to allow grinders to be lined up closely side by side, and a chalkboard panel on the back of the case that allows for branding or information-sharing regarding the current coffee. 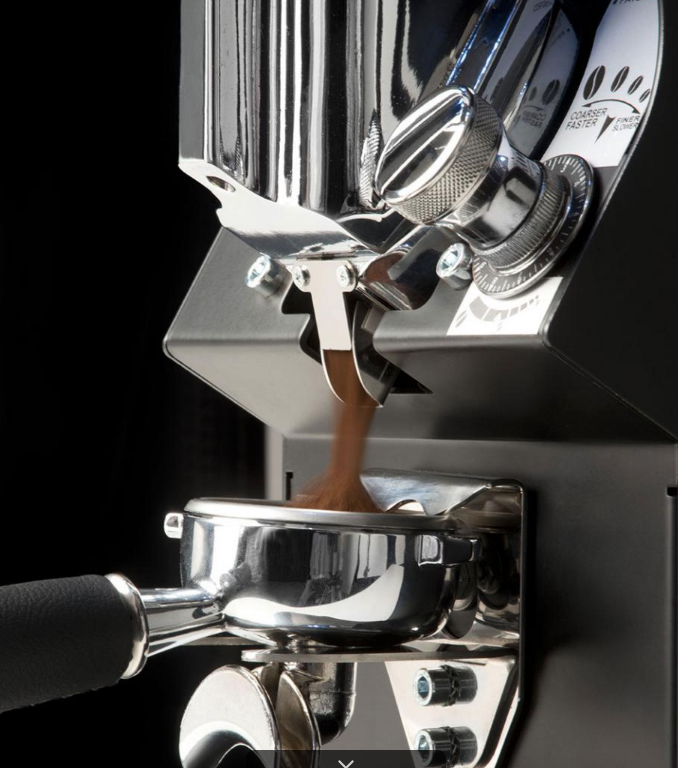 A Mythos 2 Gravimetric model will offer grind-by-weight capabilities, while the “temporized” model performs timed grinding. 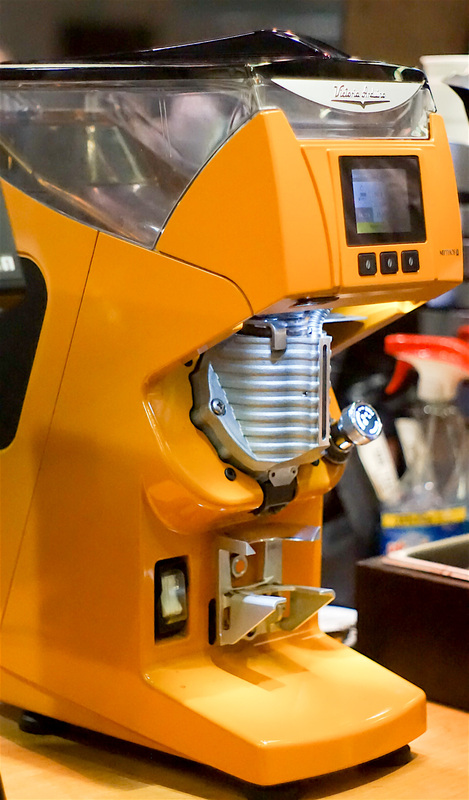 A touchscreen interface provides access to all of each machine’s variables and usage data, as well as programming for three physical buttons on the grinder’s face. For each button, the user can set the grinding temperature, motor RPM, and either the dosage weight or the grind duration. 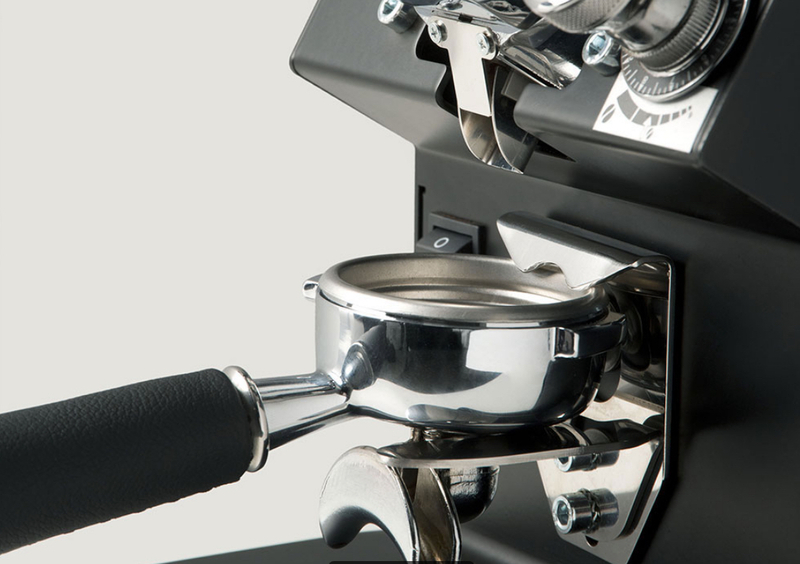 Simonelli Group Head of Marketing and Communication Maurizio Giuli told Daily Coffee News that wifi connectivity will also eventually be added to the Mythos 2, although not at first. 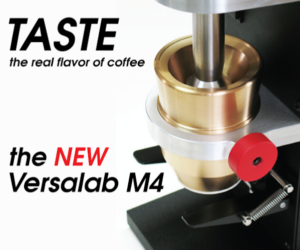 A pre-production Mythos 2 was up and running at the Simonelli booth. Retail prices for the various Mythos 2 options have yet to be determined, but are reportedly estimated to fall slightly above that of the Mythos 1, depending on the options selected. With beta testing done and many pre-orders already received, Giuli said that an official launch for the new Mythos will come sometime within two to six months, and will be followed by an introductory road show.